Baked Sausage Stuffed Peppers are a favorite because the recipe does not have tomato sauce – just the flavors of meat, vegetables and cheese. This recipe is also versatile. It was 11 degrees out the day I made this. No way was I setting myself in that cold car so I used what I had on hand – sausage, Birds Eye Wild Rice (microwave in the bag mix with broccoli and carrots) and Colby Jack cheese. Using sausage eliminates the need for other seasoning, but you can also add your own seasonings to ground beef. For us that would be salt and pepper , maybe a bit of minced garlic. You can see that sausage is a flavor boost for our household! (Sad isn’t it?? I’m working on it!) I’ve not used the wild rice mixture before but the mixture did just fine and we had the benefit of the bits of vegetables it contains. The mozzarella cheese is the meltiest, the parmesan most flavorful, but Colby Jack pulled its own flavor weight too! I also usually eat a couple of the pepper caps while I’m cooking because I love fresh crisp pepper. They don’t get diced and added to the mix and that doesn’t seem to throw the recipe off. But then again, I’ve never made it with all four caps so how would I know? Red and yellow bell peppers have a very different flavor than green bell peppers. The red ones especially are much sweeter. Any bell pepper can be used for this recipe; use the type you like the best. Prepare green peppers by washing and trimming the bottom so they will set flat. Slice off the top where it curves to the pepper side. Remove core, seeds and white pith. Place in crockpot. Dice onion and tops and bottoms of peppers. Heat 2 tablespoons of oil in medium skillet and sauté onions and peppers until onions are limp but not browned. Set aside. Brown meat in skillet, until just cooked. Remove from heat. Add all other ingredients to skillet, cheese last. Scoop into peppers, about one cup of filling per pepper. Bake at 375 degrees for 40 – 45 minutes until peppers soften and can be pierced with a fork. 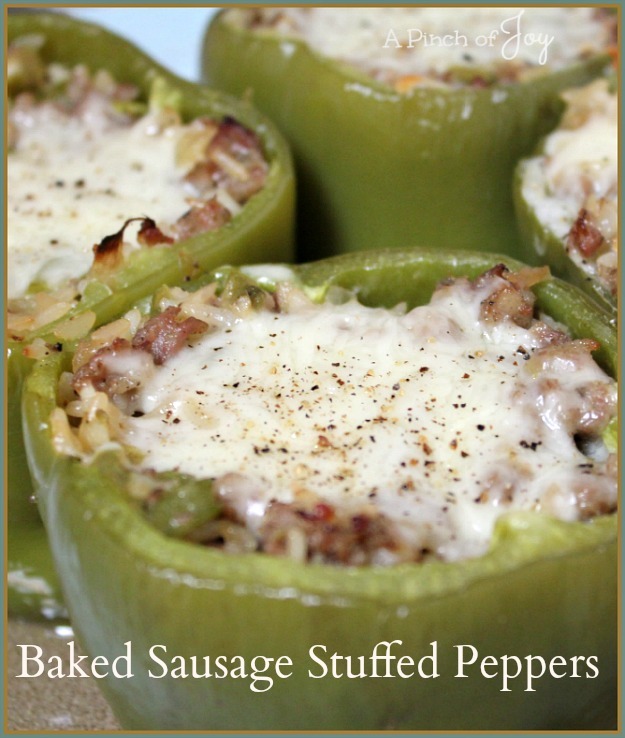 We will really enjoy your Baked Sausage Stuffed Peppers, they look awesome! Thank you so much for taking the time during this busy season to share your wonderful post with Full Plate Thursday. Have a wonderful weekend and hope to see you again real soon! I pretty much love anything with sausage so these are definitely right up my alley. I’d love to have you come link your post up the weekend re-Treat link party that ends tonight – http://www.playpartypin.com/2013/11/weekend-re-treat-link-party-43.html.